The NBC News “Commander in Chief” forum last night produced nothing new from Hillary Clinton and in many ways was merely another exercise in which she rope-a-doped the press. However, if “I don’t remember” was Hillary Clinton’s most common answer to the FBI during the notorious softball interview that led the agency to give her a pass on the criminal charges of which she is so obviously guilty, then “that was a mistake” was the first and perhaps most common answer she gave moderator Matt Lauer during last night’s “Commander in Chief” forum. On Iraq, Clinton also said, "we are not going to put ground troops into Iraq ever again," but as Military.com noted, she failed to acknowledge the roughly 5,000 American service members who are currently deployed in the country to train Iraqi security forces in the fight against ISIS. The “that was a mistake” answer permeated the entire rest of Clinton’s appearance as she tried, and in large measure failed, to present herself as the candidate of steadiness and judgement – “Steadiness. An absolutely rock steadiness,” as she put it. And while Lauer was not as bad as everyone assumed he would be, he did not really pursue the obvious lines of questioning that Clinton’s admissions of mistakes and holes in the totality of her record so obviously offered. Our friends at Breitbart were pretty tough on Lauer saying, "Matt Lauer failed to ask the White House hopeful a single question about the myriad allegations that she used her position as secretary of state to sell access to major Clinton Foundation donors." But of course Lauer’s fellow “journalists” who are all in for Clinton didn’t see it that way. "Matt Lauer Failed The Moderator Test" blared the Huffington Post. "Matt Lauer's Pathetic Interview of Hillary Clinton and Donald Trump Is the Scariest Thing I've Seen in This Campaign" - New York magazine. In the New York Times: "Matt Lauer Fields Storm of Criticism Over Clinton-Trump Forum". "Unilluminating blather" was how Time summed-up the forum. As the BBC News observed, there's an old adage in sport that the best referees are the ones that go largely unseen. 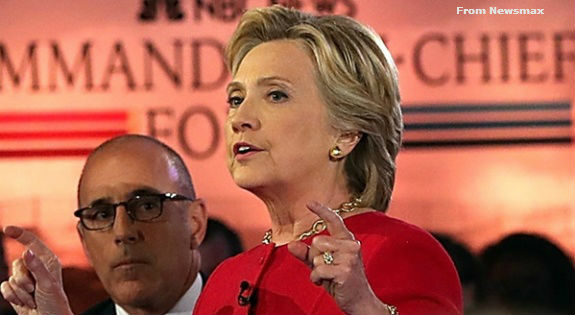 Matt Lauer was largely unseen last night, and while Hillary Clinton did her best to rope-a-dope him, his first questions teasing the multiple admissions of “that was a mistake” out of Hillary Clinton set the tone for the forum, and the rest of the news cycle. We predict that those admissions will be slow poison for Clinton as she tries to spin what was an otherwise lackluster performance in NBC’s Commander in Chief forum.